For those who don't have a possibility to reply on Helpdesk tickets in admin panel, for example when travelling, there is a new functionality that allows to reply directly from email client and still track replies history in Helpdesk. Note: A pre-requisite for this functionality is setup piping on the hosting. See more info at piping preface manual. 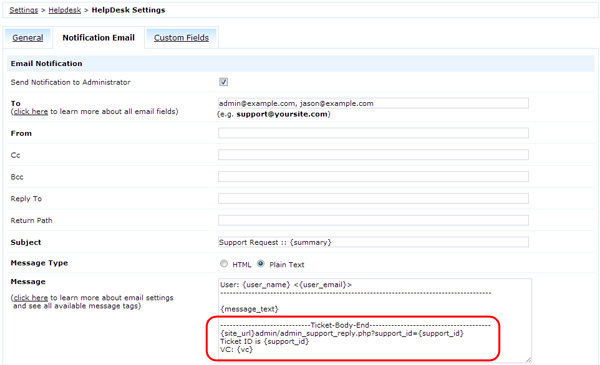 Activate Send Notification to Administrator in Settings > Helpdesk > HelpDesk Settings > "Notification Email" tab. With its help whenever you receive administrator notification and hit 'Reply' the message is recorded in Helpdesk ticket under specified Ticket ID and from there delivered to the customer. Text below -Ticket-Body-End- including this title itself is truncated when sending to customer. Administrators do not receive their own replies as notifications if their email address (in Administrator profile) matches the email in Administrator Notification settings. VC is an encrypted parameter for secure correspondence. It is possible to guess ticket number but not the encrypted text.